Thats right, the EcoRider is alive! I got the motor mounted, threw a few batteries on it and was able to do some testing. Thankfully, a friend of mine (Ben Nelson – website) who is also into electric vehicles gave me the gauge you see above, and another friend got me the shunt for the gauge. 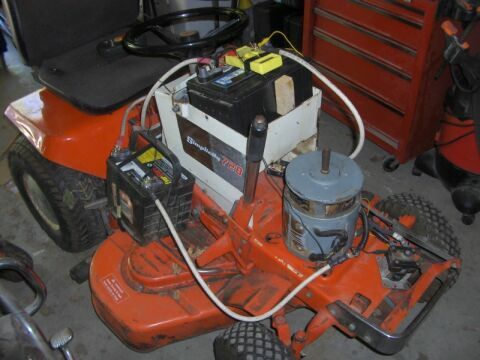 So, I was able to measure how many amps the mower pulls while using it for doing different things. This will help me size my battery pack and make a decision on what voltage I want it to run at. 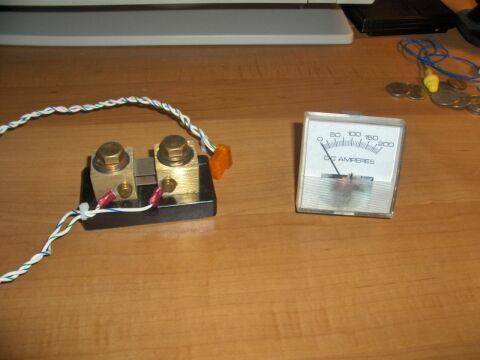 To measure voltage I just used a cheapo digital multimeter I had laying around. This is the test setup. I had two batteries laying around. One was a deep cycle, and one was a starting battery. I had to pull another starting battery out of my car to get three on the mower for the test. With everything strapped or bolted down it was time for a test drive. 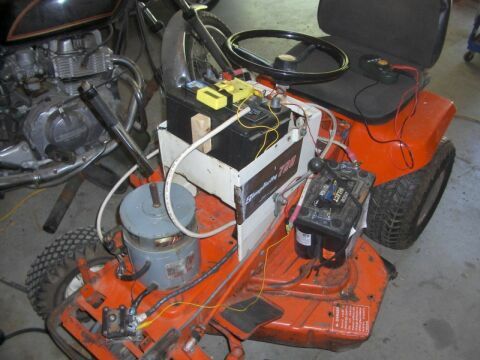 The mower ran around great at 36 volts. It pulled 20-25A while tooling around the yard. However, I quickly found out that my pulleys are a bit large. 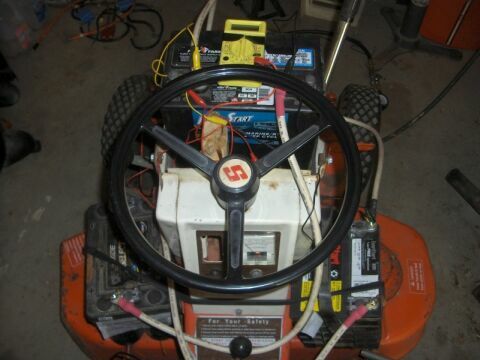 First gear is faster than I’d like it to be for precision maneuvering, second gear is faster than I would normally mow, and third is warp speed for a lawn mower. However, I am happy that the amperage draw is still relatively low for just tooling around. This brings us to the mowing part. Once I engaged the mowing deck, my amperage immediately jumped 75A higher. This kicked the total amperage draw up to right around 100A constant. This is definitely higher than I had hoped. One consolation I have is that I know my pulley is too large. Going with a smaller pulley will kick the speed back down and will decrease amperage draw some what. The test run gave me some very good information. With it I can now make some informed decisions about batteries, their capacity and what voltage I want to run. But, it also leaves me with some questions like how can I lower the amperage draw to extend battery life?